The Alt-Reality President Trumps' election victory induced delirium rather than dissipating is clearly intensifying. Whilst personally having partially succumbed to the Trump delirium hot on the heels of Britains' Brexit which implied that the approaching 8 year Dow stocks bull market target of Dow 20k was far more probable than the highly vocally often repeated view by the crash is always coming crowd. So in the run up to the probable Trump election victory my view of Dow 20k as being the most probable outcome. 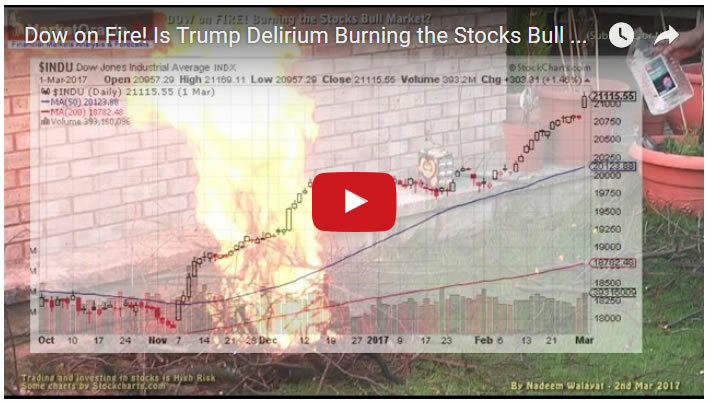 The stock market rallying from 20k to beyond 21k is akin to a market literally being on FIRE! Find out what it means for the future prospects for the stock market in my latest video.